As Washington elites drifted toward ideological poles over the past few decades, did ordinary Americans follow their lead? In The Partisan Sort, Matthew Levendusky reveals that we have responded to this trend—but not, for the most part, by becoming more extreme ourselves. While polarization has filtered down to a small minority of voters, it also has had the more significant effect of reconfiguring the way we sort ourselves into political parties. In a marked realignment since the 1970s—when partisan affiliation did not depend on ideology and both major parties had strong liberal and conservative factions—liberals today overwhelmingly identify with Democrats, as conservatives do with Republicans. 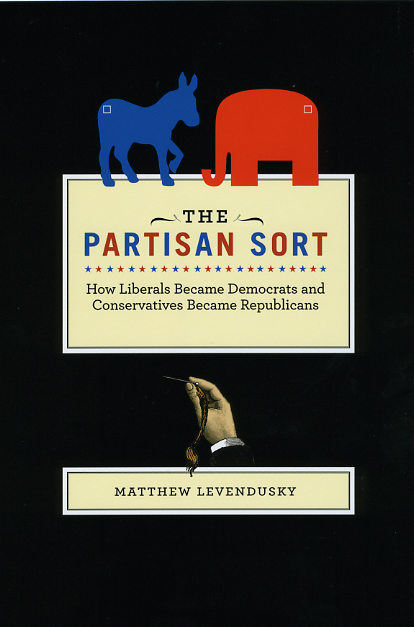 This “sorting,” Levendusky contends, results directly from the increasingly polarized terms in which political leaders define their parties. Exploring its far-reaching implications for the American political landscape, he demonstrates that sorting makes voters more loyally partisan, allowing campaigns to focus more attention on mobilizing committed supporters. Ultimately, Levendusky concludes, this new link between party and ideology represents a sea change in American politics. CHAPTER 3. Have Voters Sorted?